Phoenix Contact has an innovative range of connectors which have been specifically designed around the requirements of the LED Lighting industry. 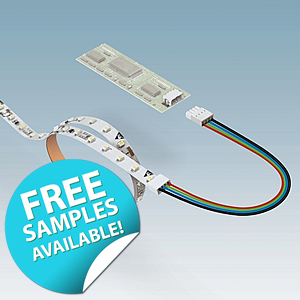 The PTSM and PTF series allow for quick and reliable connection of rigid linear and flexible LED lighting strips and arrays. Utilising a small and flat design, the PTSM product range is ideal for LED applications in particular rigid Linear LED lighting systems. The range includes PCB connectors and PCB terminal blocks, as well as board-to-board and wire-to-wire connectors. The PTF series has been designed for connecting flexible LED lighting strips, utilising this connector system it is possible to connect Wire to flexible LED strip as well as connecting 2 or more flexible LED strips directly together.